Trial Theater | Secrets for Courtroom Success | Frustrated with your courtroom results? 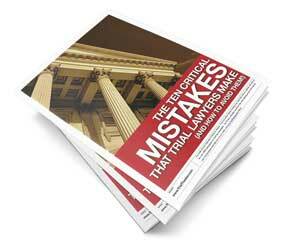 Discover the secrets for courtroom success here! If you’re not careful, you might lose the case before you even get to opening statements! Dr. Robert Cialdini, the author of the ground-breaking book on persuasion, Influence (another must-read book you should add to your trial lawyer’s library), is back to show you why effective persuasion doesn’t always rest within the message, but in the key moment before your message is presented. If you’re serious about trial work and serious about becoming a master persuader, you should read this book now. Your job in the courtroom requires that you master the ability to persuade jurors. You know that you can’t change their attitudes, beliefs, or life experiences. Cialdini shows you don’t need to — you just need to redirect the focus of their attention before they make any relevant actions. Did you hear Tony Romo’s press conference earlier this week? It was one of the classiest and most gracious speeches I’ve heard in a long time. In case you don’t know what I’m talking about, Romo was the 36-year old starting quarterback of the Dallas Cowboys (arguably the most coveted position in football). Earlier this year he was injured, and forced to sit on the sidelines until he healed. While he was out, the second-string quarterback (a 4th round rookie draft pick) stepped in to keep the team going. There’s an unwritten rule in sports that you don’t lose your job to injury, so everyone expected that Romo would be back at the starting QB position as soon as he was healthy. But nobody predicted what the 4th-string rookie would do. That rookie, Dak Prescott, took the helm of the Cowboys, leading them to an impressive 8-0 record. Sure, you shouldn’t lose your job because you got injured, but what happens when your replacement does an amazing job? If you were an objective manager deciding what would be best for the team, your decision would be simple and easy to make: Go with the rookie and the perfect record. But what if you had skin in the game? Would it be an easy decision, or would it be tortuous? Worse yet, what if it was your job on the line? Would you be willing (or able?) to endorse the younger, better quarterback, knowing that it was the best decision for your team, even if it meant that you would lose that coveted job? Objectively, it might be an easy decision, but from a personal perspective, it’s an impossibly difficult thing to do. I don’t know about you, but I don’t think I’d be magnanimous enough to step aside, even if it was in the best interest of my team. But Tony Romo was selfless. He pledged his support to the rookie QB, because he felt it was in the best interest of his team. It’s in this moment you find out who you really are, and what you’re really about. You see football is a meritocracy. You aren’t handed anything. You earn everything, every single day, over and over again you have to prove it. That’s the way that the NFL, football works. Here’s the important trial lawyer lesson that I want you to take away from his speech. That’s the way life works, too. If you want to be a great trial lawyer, you have to earn it. What have you done to earn it? Did you win the biggest verdict ever seen in your courthouse? Did you win your last 10 cases in a row? Did you win every motion you argued this month? Congratulations! I’m really proud of you! Seriously, those are great accomplishments, and I’m really, really proud of you. Those victories are… Last week’s news! You can’t survive on your past victories. Your next client doesn’t care what you did for your last client. They don’t care what you did for your last 100 clients. The client standing beside you in court this morning doesn’t care that you won your last 100 trials in a row, he only cares about his case, and what you can do for him now. He expects you to be the best lawyer in the courthouse today, and expects you to do a great job for him now. Those victories have already been cashed and spent, so if you want to maintain your status as a top-level attorney, you have to prove it all over again every time you step into the courtroom. It also doesn’t matter if you’ve lost your last 100 trials in a row. It doesn’t matter if you’ve screwed up, it doesn’t matter if you’ve been lazy, and it doesn’t matter if you’ve been less than you know you should be. That means you start your next trial with a clean slate. This trial is a brand-new opportunity for you to excel. These jurors have no idea what your past looks like. They have no idea whether you’ve won every case you’ve ever tried, whether you’ve lost every case you’ve ever tried, or if you’ve never even tried a case before. All they’ll know is what you deliver once you walk through the courtroom doors. Earn your spot on the team by giving them what they deserve. Be completely prepared, and deliver the strongest, most persuasive arguments you can. You want to be the starting quarterback? You want to be the star of the show? You want to be the trial lawyer that other lawyers fear, that judges trust, and that clients scramble to hire? I don’t know where you are right now, and I don’t care what your past looks like. All I know is that, if you truly, truly want to be, you CAN be that lawyer. Every week, you’ll have to earn it, but if you work hard enough, you can do it. I promise. Just remember that every morning wipes out yesterday’s victories, so you need to start fresh and honestly answer the question: "Do I deserve the starting position?" Only you can answer that question. For your client’s sake, I hope the answer is always "Yes."